Don’t enroll before you find out how much your bachelor’s degree is worth. Check out this list of Illinois’s best four-year colleges by earning potential. 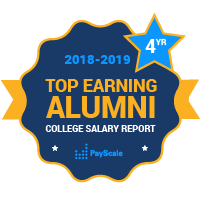 The Prairie State contains over 100 four-year colleges, and PayScale’s College Salary Report has the data to help you identify the Illinois colleges with the highest paid graduates. Some of the most famous include the University of Illinois, Illinois State University, Northwestern University and the University of Chicago. Top employers in the state include Allstate Insurance and State Farm. But some of the highest mid-career salaries overall go to alumni of another private school, The University of Chicago. This world-class private research university comes in with high median salaries despite fact that only about a quarter of degrees awarded are in STEM subjects. This goes to show that a liberal arts degree can pay off. When we include alumni from Illinois colleges with graduate degrees in our calculations, we see a slight uptick in the early and mid-career earnings at most schools, with a few exceptions, like Wheaton College. The Midwest is a haven for private schools, especially those with religious affiliations. It’s interesting to note though that only one of these schools, Wheaton College in Wheaton, Illinois, is classified as a sober school by The Princeton Review.